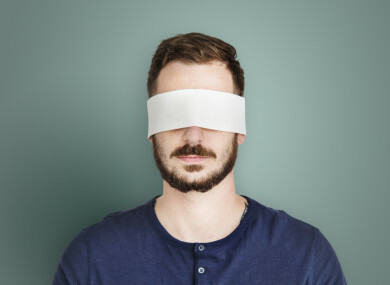 It is frustrating that the challenges vision impaired people face are different from what is portrayed in Bird Box – because they are structural, writes Kevin Kelly. IN THE LAST month I have faced endless questions around blindness and what it is like to be blind. This sudden public interest, bordering on fascination, with all things blind-related was sparked by the now infamous Netflix film Bird Box. Who would have thought that a mediocre film set in a post-apocalyptic world, about creatures who drive you to kill yourself just by looking at them, would spark a global craze of blindfolding yourself? Leaving aside the bizarre lengths that some people will go to for fifteen seconds of social media fame the film has drawn our attention to how little the average person knows about what it is like to live with a vision impairment. Eighteen years ago, when the lights literally went out for me at age fourteen, I spent a period of time fumbling around, walking into things, knocking things over, struggling to know whether clothes were inside out as well as overfilling cups and bowls – as you can well imagine. However, this phase was only temporary and gradually with help and support, I adjusted to my new reality. Like many people reading this, I still occasionally walk into things, but usually only if its the morning after the night before! Seldom in the past has anything catapulted blindness to the fore of people’s thoughts and conversations like Bird Box did. I’m well aware that there’s no malice in these questions but such stereotypes are not helpful. Undoubtedly, living with a vision impairment presents significant challenges and obstacles, although probably not the ones you’d expect, and certainly not the ones portrayed in Bird Box. Take a simple example of going to the bank – if you imagined yourself doing this as a blind person, you might think that finding the building would be one of the biggest problems – but you’d be wrong. What happens when you get to the bank and it doesn’t have any cashiers? One of the biggest problems with modern banks – as well as lots of other businesses – is that the majority of their terminals are now touchscreen and they are not accessible for people who are vision impaired. Trust me, it’s hugely challenging to do anything independently when you can’t see that screen. What is worse than banks and other businesses is that in Ireland today, the government is constantly encouraging everyone to interact with state services through online portals too, rather than calling into a physical office. On the face of it, given that someone who is blind or vision-impaired does not need to leave their house to use these services, this should make life easier. However, the reality is that due to a lack of thought, poor design and the government’s failure to implement the European Web Accessibility Directive – many of these services are either fully or partially inaccessible. So, forget the Bird Box challenge. If you want to engage in a worthwhile challenge here’s my suggestion: Try to challenge yourself to think differently, open your mind about blindness and start to challenge your own misconceptions as well as those of others in society. Of course, sight loss presents significant barriers and obstacles however with the right support and rehabilitation, those barriers can be overcome – allowing people who are blind and vision-impaired to live a life of their choosing. We have learned how to navigate the city streets but now we face new problems that are structural in that entire technological systems are designed with no thought for the vision impaired. We are resilient and adaptable but we can only adapt so much, we also need society to adapt its technological systems so that we can navigate the maze of modern living. Kevin Kelly is the Head of Policy, Advocacy & Campaigns with the National Council for the Blind Ireland. Email “Forget the Bird Box challenge: Try dealing with automated services when you are blind”. Feedback on “Forget the Bird Box challenge: Try dealing with automated services when you are blind”.